Advertisers from Russia can pay for ads using the mobile app. Agencies can only pay in cash or by transferring funds between a client's campaigns. You can top up your shared account or individual campaigns. 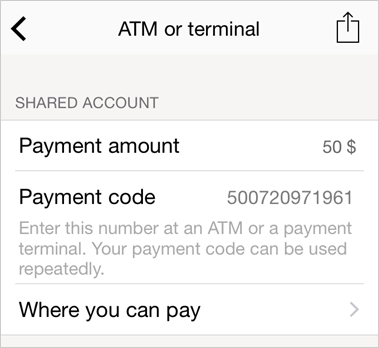 On the Summary screen, you can enable the shared account feature. On the Summary screen, tap Shared account. Enter your payment amount and select a payment method. The Yandex.Money account you use should be under the same username as the Direct ad campaign you want to pay for. The maximum payment amount is 100,000 rubles with an identified account and 15,000 rubles with an unidentified one There is no commission. If you have not previously paid using the app, enter your Yandex username and password and tap Log in. Allow the app to access your Yandex.Money account: enter the one-time password you received in an SMS or your payment password and tap Allow. To confirm your payment, tap Pay. The minimum payment amount before VAT is 1,000 rubles and the maximum is 15,000 rubles. Choose your payment method ATM or terminal. Your payment code will appear on the screen. You can copy it or pay by SMS or email. Just tap . To find the nearest payment points (terminals, ATMs, registers in certain stores or cellular providers, bank branches) on the map, tap Where to pay. Allow the app to use your location data. Tap to find a pay point by commission amount and working hours. In the interface, find the ATM or terminal button with the Yandex.Money logo and enter the code you received. You can add one or more bank cards to your account. In the future, you can just select a card from the list without having to re-enter your payment information every time. The maximum payment amount is 49,999.99 rubles There is no commission. If you have not previously paid using a bank card in the app, tap Add card. You can enter the card number manually or scan it in. We will withdraw two rubles to validate your card. If the withdrawal goes through, then your card will be added and we will return the amount that was withdrawn. Select a card to pay from and tap Pay. To remove a card from your account, select the Bank card payment method, tap Change and delete the card from the list. To defer payments, you must have a Yandex.Money account. The account should be under the same username as your Yandex.Direct ad campaign. You can view the maximum amount you can defer on your Profile screen under Limit of deferred payment. There is no commission. Tap Issue an invoice to confirm the operation. You must pay the bill within 15 calendar days. On your campaigns screen, tap Top up. Enter your payment amount and select a payment method. To transfer funds between campaigns, you must have a Yandex.Money account. The account should be under the same username as your Yandex.Direct ad campaign. The minimum transfer amount is 1,000 rubles. There is no commission. All rules and restrictions can be found in the Reallocating money between ad campaigns section of the Yandex.Direct Help. The From another campaign option appears if you have other campaigns that you can withdraw funds from in accordance with the transfer rules. 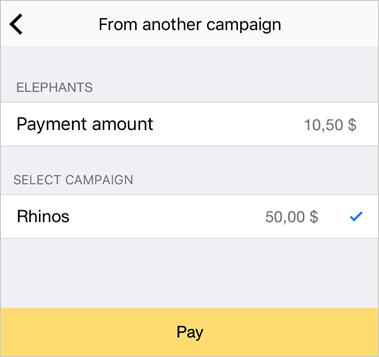 Select the campaign that you want to withdraw funds from. If that campaign doesn't have enough funds, select another one, etc. Then tap Pay.